"Dare to shine 24/7.Ink technology creates 24HR wear shadow for our most intense, long-lasting color saturation. Cream formula glides on without creasing and keeps color vibrant". 35 - On and On Bronze - Metallic, neutral bronze. 40 - Permanent Taupe - Matte, very cool brown. 65 - Pink Gold - Metallic pink with gold shimmer. 70 - Metallic Pomegranate - Metallic reddish plum. The most wearable shade out of the 4 for me is definitely On and On Bronze. It's so easy it literally takes about 5 seconds to apply and blend, and it looks as if I've made so much more effort than I actually have - great for when I've got a toddler raiding through my makeup bag and a baby crying to be picked up, lol. 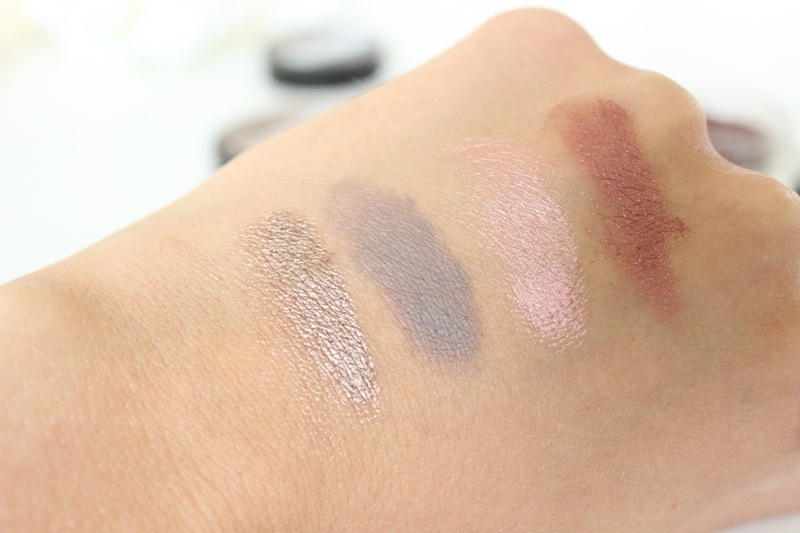 The pigmentation and creaminess of all 4 of these shades it absolutely spot on. Permanent Taupe is a shade I would never have chosen for my eyes as it's a bit too cool, but I actually use it on my eyebrows and find it works so well. It's been said it's a dupe for the Anastasia Dip Brown Pomade, but I've never actually tried that so couldn't say for definite. I grab my Real Techniques Eyeliner Brush (from the Nic's Picks set), and line my brows, filling in any sparce areas and giving them a really crisp line. It's so creamy and lasts all day without smudging. If you need an ashy brown for your brows, be sure to give this a go. It's really, really ashy (verging on grey) though, so probably only good for those with blonde hair to be honest. It looks REALLY grey in the swatch above actually, but it doesn't apply to the brows that grey I promise. Metallic Pomegranate hasn't had much use yet, but I can see it being a firm favourite in Autumn/Winter. It's a stunning metallic plum with hints of red which will look amazing teamed with a tartan scarf in the cold months. Pink Gold is the newest of my stash and so, so pretty. I'm looking forward to using this through the spring/summer months. I've found it looks gorgeous on it's own, but even more so teamed with some of the pink and gold's from my Naked 3 palette. For £4.99, these beauties are a must-have for any makeup bag, and I'm looking forward to trying more shades in the range. 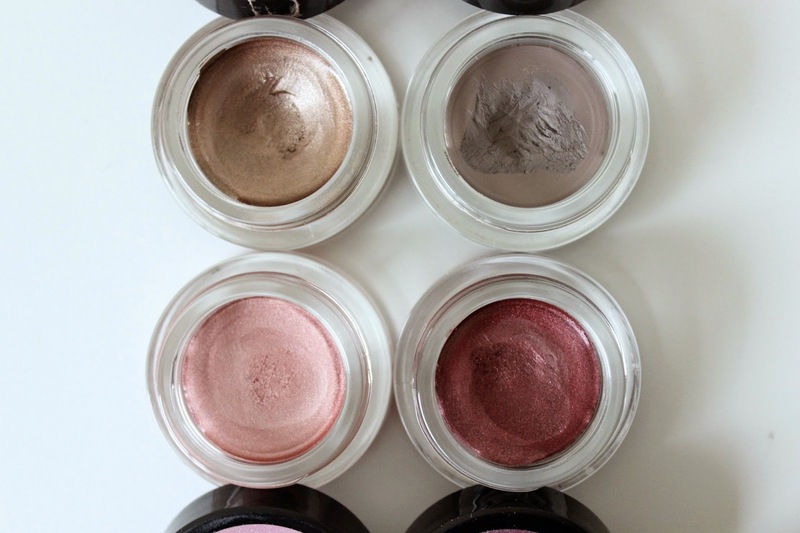 I just wish they'd bring out some matte, skin tone shades similar to MAC's Soft Ochre or Painterly Paint Pots to use as a base as I reckon they'd go down a storm. 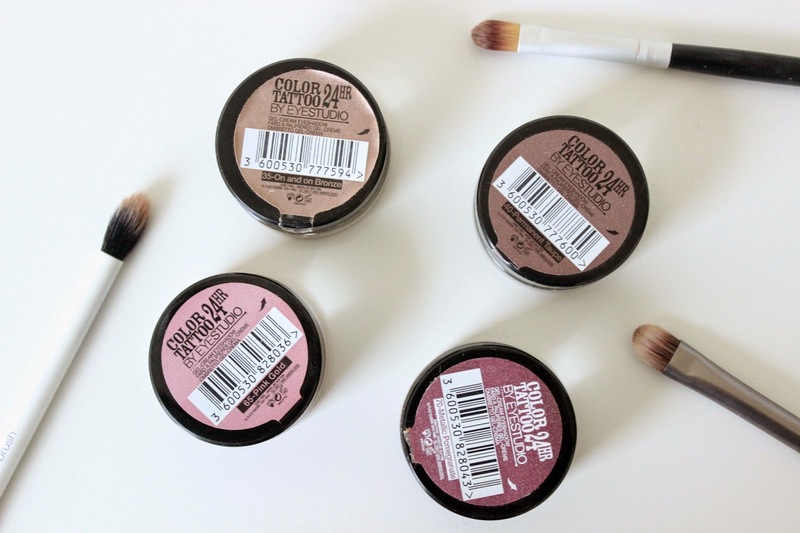 Have you tried any of Maybelline's creamy pots of goodness? I have the bronze color tattoo and it's one of my favourite items in my collection! I need to get these other shades, that pomegranate one is so pretty! I adore these colour tattoos! 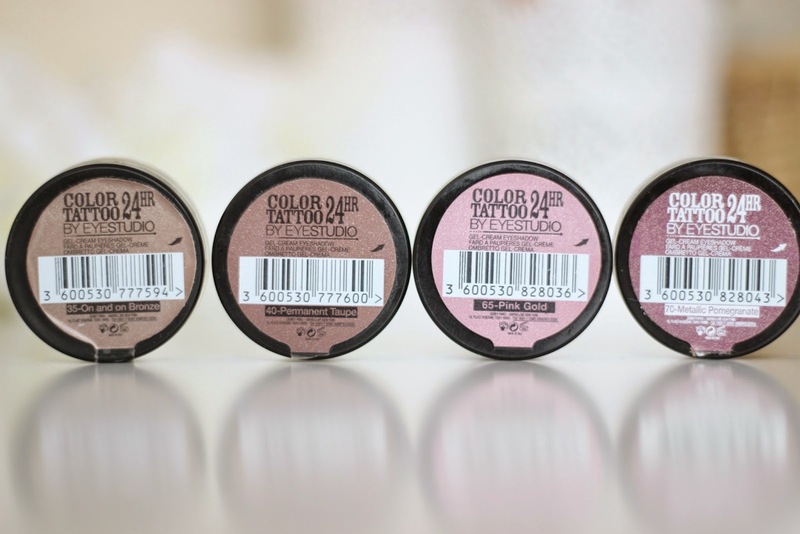 Permanent taupe is the one I wear the most, I wish they had even more shades I'd get them all! I've just won 'on and on bronze' in a giveaway and I can't wait to get it! I already have the Leather effect 'Vintage Plum' and it's one of my favourites. On and one bronze looks so beautiful! Do they crease at all? Oh my gosh the pomegranate shade looks divine! Need.